Sell the paper, build the party! Liberator 302 - out now! The post-election edition of Liberator is published and mailed to subscribers today. And the magazine's controversial assessment of the recent general election has been reported in today's Guardian. Commentary and Radical Bulletin taking apart the post-election spinning. David Boyle and Jeremy Hargreaves on the need for the Liberal Democrats to encourage thinking and refresh party policy. Post-election assessments from Liberal Democrat activists around the country. Michael Meadowcroft on the postal voting scandal. All the regular features, including the venerable Lord Bonkers. If you are not yet a subscriber, now is the time to sign up. 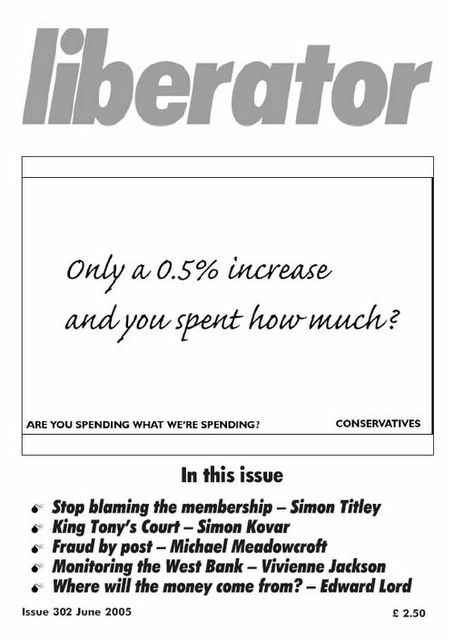 Liberator has been published since 1970 and remains Britain's foremost vehicle for liberal debate. 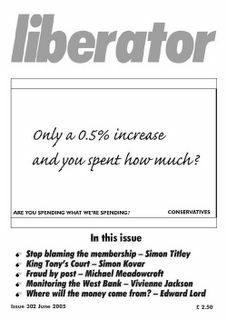 Details of how to subscribe are on the Liberator website.